ROMA — If everything goes according to plan, Alejandra will no longer feel like her mother is a stranger. She'll go to a good school in Houston, not one lacking basic supplies. She'll eat a real breakfast, not the bread and water she was fed on the bus from Guatemala. On a rainy evening in early March, Alejandra, 14, joined a dozen undocumented immigrants, mostly women and kids, who turned themselves in to a busy unit of the U.S. Border Patrol in deep South Texas. They were picked up and “processed” — some field paperwork here, an inventory of belongings there — in a wildlife refuge a stone’s throw from the river-border they’d just illegally crossed. Alejandra stood beneath a drizzling rain next to a Border Patrol van while she calmly recounted the brief but scary passage across the Rio Grande, which she knew by the name it’s given on the south side: El Río Bravo. Her smuggler, she said, left her, her 12-year-old brother and their 9-year-old cousin on the Mexican riverbank. The sudden abandonment surprised her — but what could they do except paddle? She said she hadn’t seen her mother since she was 6 — eight years ago — in their native Guatemala, and nothing was going to keep Alejandra from reuniting with her in Houston. Like the other undocumented kids traveling alone, Alejandra was to be given a “notice to appear” at an immigration court in the city where she has relatives — the largest city in Texas, in her case — and then released. 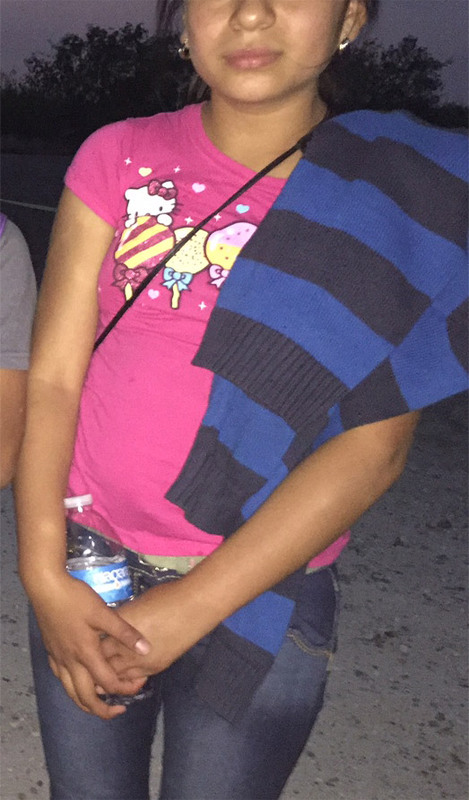 Alejandra said a smuggler left her, her brother and a cousin in a boat to cross the Rio Grande alone. Alejandra's story is at once remarkable and mundane: remarkable because three unchaperoned children riding, eating and sleeping on a bus for nine days and then paddling themselves away from a dangerous Mexican border town entails a unique blend of desperation and moxie, not to mention a mostly unseen but well-financed network of cartels and smugglers. Mundane because this happens every day in Roma, a popular smuggling corridor in Texas' Rio Grande Valley, which isn’t so much a valley but a sieve through which thousands of undocumented immigrants slip into the United States, making it the busiest illegal crossing point by far on the U.S-Mexico border. Multiple inflatable rafts on the water. Emotionally shaken kids in the back of Border Patrol vans. Dope worth a quarter-million dollars on the street, dumped on the river’s edge. Roadside apprehensions. People running, swimming and shouting obscenities in and alongside a river shared by two countries. The Texas Tribune witnessed all that and more during an afternoon with a three-man public relations team from the U.S. Border Patrol in this heavily trafficked patch of borderland, where a surge of unaccompanied kids and families that began in 2014 keeps pushing apprehension numbers through the roof. That’s when the smugglers start moving people and drugs. Slick-bald and stocky, Perales is a 16-year veteran of the Border Patrol and considers himself a lifer now; one doesn’t have to wonder if he likes his job. He admits he gets off on the “adrenaline rush” of the chase, and he delights in showing the news media what agents like him go through every day — the long hours, the unforgiving terrain and climate, the scorn he sometimes feels from people who don’t exactly believe in their mission. Border Patrol Agent José Perales peers out across the Rio Grande in Roma, Texas, while searching for a group of five undocumented immigrants reported to have crossed the river in a raft from Ciudad Miguel Alemán, Mexico, on March 8, 2016. As he spoke, the public relations fallout from a New York Times Magazine story, published five days earlier, was still reverberating throughout the sprawling agency: It recounted the tragedy that befell Jose Antonio Elena Rodriguez, an unarmed teen who was killed (shot 10 times from behind, the article said) in 2012 on the Mexican side by a Border Patrol agent standing in Nogales, Arizona. The agent has been charged with second-degree murder. Perales mentioned a different case — one involving an undocumented border crosser, Edgar Hugo Muñoz, who was charged with assaulting a federal officer after allegedly overpowering a Border Patrol agent near McAllen, about an hour south of here, during an apprehension attempt gone awry on New Year's Eve. According to court records published by Breitbart, the conservative news outlet, Muñoz punched and beat the agent with the agent's baton before another agent arrived and helped arrest the Mexican national. The way Perales sees it, Americans often don’t see or understand the unique pressures agents face on the front lines of the border, including this mostly rural stretch sitting across the river from violence-wracked Tamaulipas state, where the powerful Gulf Cartel continues to square off with the rival Zetas for control of smuggling routes into the United States. Perales didn’t randomly select Roma, perched on the Rio Grande in impoverished Starr County, to give the Tribune a taste of what agents are up against. The town of roughly 10,000 people, whose colonial center and river vistas were featured in the 1952 film "Viva Zapata!," is something of a smuggler’s paradise. Thick brush and brambles, not to mention the invasive Carrizo cane that’s widely seen as an impediment to interdiction efforts, cover the river banks and deep arroyos here, offering ideal hiding places for humans and dope. More importantly, the town sits so close to the river that agents say it takes only 15 seconds to run from the soggy bank to the Dollar General store and other shops backing up to the Rio Grande. Right in front of those shops and neighborhoods sits Highway 83, where a vehicle full of immigrants or a few bundles of weed can soon melt into the rest of the traffic — and off to Dallas and Houston they go. “They can actually run just two blocks and they’re on 83,” Perales said. Evidence of crossings can be found amid the litter up and down the river’s edge — abandoned backpacks, bras, socks, swimming trunks, life jackets, pieces of shredded rafts and the like. On any given day, people who live in the neighborhoods between Highway 83 and the river say they see immigrants running away from the water, crouching behind bushes, store parking lots, the Jack in the Box, you name it. The discarded clothes of undocumented immigrants lie alongside the Rio Grande riverbank in Roma, Texas, on March 8, 2016. According to Border Patrol agents, undocumented immigrants commonly change into a spare set of clothes after they cross the river in order to stand out less once inside the United States. “And then you see them running. A while ago — like five minutes ago, before y’all got here — there was two running over there straight to the store,” he said. He was referring to the Dollar General next to the river, a few blocks away. The store’s manager declined to talk to a reporter on a recent visit to Roma, but Dollar General is a familiar name on Border Patrol radios around here — radios that crackle with staccato announcements of apprehensions and sightings, like clockwork, when the airboats quit running. Methods used to track the movements of immigrants and smugglers range from tethered surveillance blimps repurposed from the U.S. military’s Afghanistan operations to old-school “sign cutting” — the tracking of footprints in the dirt or trails cut through the thick brush. On the Tribune’s visit to Roma and its environs, the action began in earnest with a sighting from remotely operated “Drawbridge” cameras, immediately relayed over the radio to Perales and his colleagues in the field around 4 p.m. on March 8. Operation Drawbridge, inaugurated as a state-federal program in 2012, provides agents in the field, 24/7, with images from hidden wildlife cameras equipped with motion detection and low-light capabilities. A dispatcher said “four bodies” — four people — were spotted on camera crossing the wildlife refuge, a popular spot for children and families. By the time Perales and his crew arrived, four children from Central America had already turned themselves in to agents who were closer. Unaccompanied child migrants from Honduras voluntarily turned themselves in to U.S. Border Patrol agents near Roma, Texas, on Mar. 8, 2016. People 17 and under who cross illegally into the United States without adults are known as unaccompanied children, or UACs; the ones from Central America tend to travel alone because under U.S. policy they are typically released to relatives or caretakers they know. Though the children are subject to deportation, most of the ones who came in a huge wave that began 2014 have avoided it so far, data shows. Daniela, 17, apprehended alongside Romero, broke down when asked why she left her native El Salvador, which is believed to have the world’s highest homicide rate outside a war zone, having racked up more than 2,000 killings this year. Alejandra, her brother and their cousin — all from Santa Cruz del Quiché, Guatemala — later turned themselves in near the same spot. They ate and slept on the bus all the way from Guatemala; only her 9-year-old cousin admitted he was scared during the passage across the swift river. Alejandra said her family arranged for their passage to Texas, and all she could think about was reuniting with them in Houston. The surge in unaccompanied children and so-called “family units” has helped push apprehensions in the Border Patrol’s Rio Grande Valley sector way past every other region on the U.S-Mexico border. In fiscal 2015, the sector’s 147,000 apprehensions accounted for 44 percent of the total and more than double the numbers registered in the next busiest, the Tucson sector. Kids and families aren’t the only ones crossing the southern border illegally, of course. Plenty of adults come, too, but there’s a big difference: They generally make a run (or a swim) for it. That’s exactly what happened a few minutes after the four Central American kids were whisked away in a Border Patrol paddy wagon. The radio informed Agent Perales that a few more “bodies” had landed in a raft along the river bank close to “the purple house.” The brightly colored wooden home on the river near Roma sits near a crossing point so popular with smugglers that the street in front of it is known to agents informally as Purple House Road. With agents on each side of the suspected landing area closing in, a raft hugging the river bank soon was spotted, but it just as quickly turned around and headed back south, as smugglers yelled “chinga tu madre” and other expletives from the other side. A few minutes after that, K9 Agent Cesar Treviño said his dog was picking up a new scent. “I think there’s another raft,” he said. It turned out to be the understatement of the night. Over the next two hours, the agents’ radios descended into a cacophony of boat sightings, reports of people running through town, immigrants jumping in and out of cars — and finally a nighttime visual on a raft that turned out to contain hundreds of pounds of bundled marijuana, hurriedly abandoned once a Border Patrol agent and a Texas Tribune photographer emerged from the bushes. At one point before it got dark, just below Purple House Road, five people could be seen clinging to branches on the U.S. riverbank. Agent Isaac Villegas and K9 handler Treviño, his dog barking wildly and straining at the end his leash, tried to talk the would-be immigrants out of water. Neither they nor their apparent smugglers were having any of it. After chasing away smugglers who were using rafts to bring drugs across the river, Border Patrol and Texas DPS agents inspect several large packages of marijuana abandoned near the Rio Grande shoreline near Roma, Texas, on March 8, 2016. The packages were later found to weigh 313 pounds, making them worth an estimated $240,000. One of them responded in a defiant if groggy-sounding voice: “You wanna bet? We’re going back to the other side.” And off they swam. On the way back to the station, where the seized pot was assigned a street value of $240,000, Agent Perales said it would start all over again tomorrow: the kids, the families, the dope smuggling and, he confidently predicted, the adult “turn backs” they encountered today at the water's edge. Texas Tribune reporter Julián Aguilar contributed to this story.